This top of the line black Naugahyde Santa belts with a large decorative cast metal belt buckle. This gold gilt finished belt buckle will fit into six gilded belt eyelets. The pair of soft knit cotton Santa Claus gloves is comfortable and can be warren for extended periods of times. Its stretchable material allows easy on/off. These round Santa glasses will give any Mr or Mrs Claus the perfect finishnig look. It has a silver metal frame with clear plastic lenses. This black naugahyde Santa belts with a belt loop comes in three sizes and six gilt eyelets. Here is a Santa hat for even the small heads. It fits a head anywhere between 19-22 inches in circumference. 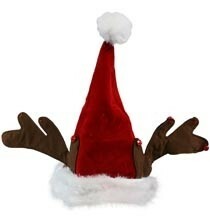 Bring the holiday spirit by wearing this medium size Santa hat that is made of red and white plush fur.